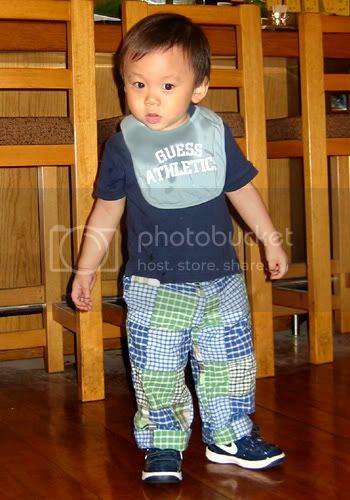 my tamjiak li' boy :) - A mummy's inane blabberings..
claudiacheng, thanks for buying the Nike shoes for him. Cool eh!! 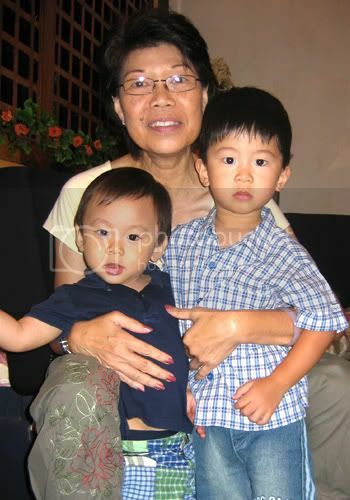 Mom-in-law at her happiest..with her 2 grandsons. Hmm..the 2 boys don't really look alike eh :P.. It's great to see Aidan well again. He was sick for almost 3+ weeks..It took a while for his cough to be completely cleared and it was only when he'd almost finished the entire bottle of antibiotics that it finally stopped and we could tell that his lungs were clear. The only unfortunate part was that the meds made him puke (intentionally) as a way to clear his phlegm and he was also having really loose stools (also an effect of the meds) which led him to getting bad diaper rash. Fortunately, the creams given by the doc worked wonderfully and the rashes subsided alot in just one night. For a while, Aidan was getting more food than his usual 'coz blur mommy of his forgot to inform mom-in-law & Nenita that he gets food @ his playschool. Before he leaves for school, he has 240ml of milk and usually some cereals for breakfast..When he gets to school, he gets another round of breakfast with milo. And at about 11am, he eats lunch there and when he gets home abt 1pm, my maid will feed him about 2 bowls of porridge + fruits which he will devour to the last morsel. After I'd finally informed mom-in-law about it, she thought that the school was probably not feeding Aidan enough since he does still seem quite hungry when he comes back. But when she checked with the principal, it seems that Aidan eats more than the other kids there. Most kids are usually satisfied with just one serving but my Aidan..he will 'complain' when it finishes and usually, the teacher will feed him another bowl or 2. Same for the desert portions :P...Not sure whether the school's gonna charge me more next month for the extra portions of food! Gonna be taking this Friday off. Apparently, I have 3 off days to clear even though I'm not even on the job for one month yet. The financial year ends in Aug so everyone is supposed to clear their leave or else it gets forfeited! So, gonna have some moms over with their kids to swim over at my place :D~I havent gotten down to inviting pple yet..only some whom i've replied via LJ tru their comments. So far, it's meganmacy, bbhome, auntyadele who has confirmed. Any other moms wanna join in, feel free to :) Hmm..am so tempted to order Lana's cake *slurp*..
His pants are so cute!!!! Where are they from? And he really is a drool machine man... hahaha. The pants from Gap though I cant recall where I got it..I know it was cheap though..abt 5 bucks :P..
Yeah lor..still drooling so much *sigh*..wonder when he'll stop! so cute ah adian boy. i think he and his cuz look alike, its their nose and mouth lah. wah how many days of lv u hv in a yr. work for less than a mth and already 3 days of leave?! issit..even their grandparents dun think they look alike leh.. I have 21 days days only but my 3 off days for this year includes the month of Aug you see..
How long does he spend at school? we drop him off at 8am and my parents-in-law picks him up at 12. Hmm..mostly playstuff and just about an hour of 'classes' using flashcards and reading sessions.. It's more a place for him to get to know more friends and enjoy himself instead of staying home and bullying the maid hehe..
aidan hao lian jai orh. i assume you meant leng-jai hehe.. The first photo makes him look so grown-up. And tall too! heh..actually, it's really a relief that he can eat so well. I've seen kids who are really fussy and it takes ages just to get them to finish their lunch/dinner..I've ever seen a mom burst into tears at a restaurant when her daughter simply refuses to eat at all..Very cham! Aidan's such a big boy now!! He's so good-looking. If only my boy eats half as much as Aidan! How did you build up his appetite? I think it's genetic. Both hubby and I are greedy pigs hehe..From young, Aidan had always been a milk guzzler and when he started on solids, he had always been eating alot. We could never tell when he's full becuz he'll just continue to eat if there's food. ooooh..if u can do that, can i be ur manager? I think I can call Ridley's Believe it Or not immediately..
hey, when gabe had bad cough with too much phlegm to clear, i give him mucosolvan, this helps to dissolve the phlegm abit so he would not cough so hard till his throat was irritated and vomit. heh..i am only taking 1 day..will probabl forfeit the other 2..paiseh to take so many leave when i started work just not long ago..
His nike shoes are cool! yeah i was. Was watching Michael Chiang's private parts. U were there too? oh! U were there with ur kids and hubby? wow wee.. Aidan is really big boy now, huh?! And all e best in your new job. Hope u will continue to enjoy it. Thanks! I know i didn't have much time to comment on ur lj too. Wanted to ask u abt how u are settling there..Would try to read ur lj entries thoroughly soon. oh goodness... Aidan looks like he grew some height! he looks taller in these pictures... =) amazing how kids grow up so fast. Same for ur li' stepbrother too right? I'm sure he always looks different and much bigger whenever u see him.